Real estate takes longer to sell and freezes up faster than stocks, so caution is warranted now. Stocks are likely to run harder than ever into late 2019 or very early 2020. After that, expect a recession, and ultimately a depression to set in. China has a long-term plan: To become the number 1 country in the world and supplant the U.S. leadership since World War II. They are more willing to take more pain for that than Americans are. In this video, I elaborate on three principles you must focus on between now and 2020. And I share two other, less radical but equally inspirational, examples of how investors and businesses took advantage of the last sale of a lifetime. In the last week, there has been a slew of articles warning that we’re on the verge of a recession. Are Markets About To Explode Upwards? was just posted to Harry Dent's personal blog. If the Dark Window occurs again exactly 90 years after the infamous 1929, even the most bullish forecasters on Wall Street won’t see it coming. The first warning sign for the near-term peak is the sharp collapse in the Smart Money Flow Index over this year’s rally after the late January 2018 peak. Our politics have become extremely polarized in the last decade. It’s related to the mega 250-Year Revolution Cycle sweeping over us right now. The leading-edge penthouse at the newest 220 Central Park is being offered at $250 million for 23,000 square feet. Does this sound like a bargain to you? 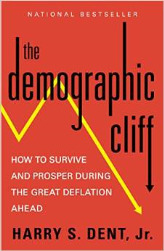 Harry Dent writes an economic newsletter that reviews the economy in the US and around the world through demographic trends focusing on predictable consumer spending patterns, as well as financial markets, and has written several books. Harry has been featured on“Good Morning America, PBS, CNBC, CNN/Fox News and in Barron’s, Investor’s Business Daily, Entrepreneur, Fortune, Success, U.S. News & World Report, Business Week, WSJ and Omni. Fields of study: Master of Business Administration (M.B.A.), Economics. 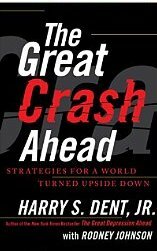 In his most recent New York Times bestselling book, The Great Depression Ahead, Harry S. Dent, Jr., predicted that the stimulus plan created in response to the first crisis would hit demographic and debt saturation headwinds and ultimately fail. In 2010, the stimulus plan had started to fail, and it was already stalling by the first quarter of 2011. The Great Crash Ahead outlines why the next crash and crisis is inevitable, and just around the corner—coming between 2012 and 2014. With incisive critical analysis and historical examples, this book lays bare the traditional assumptions of economics. Dent shows that the government doesn’t drive our economy, consumers and businesses do; that the Fed does not create most of the money in our economy, the private banking system does; and that the largest generation in history is now saving for or moving into retirement, meaning slowing growth. This is the new normal! Dent writes an economic newsletter that reviews the economy in the US and around the world through demographic trends focusing on predictable consumer spending patterns, as well as financial markets. Economy & Markets Daily is the first e-letter of its kind that uses the power of demographic trends and purchasing power to accurately identify economic and market boom and busts. Subscribe for free.